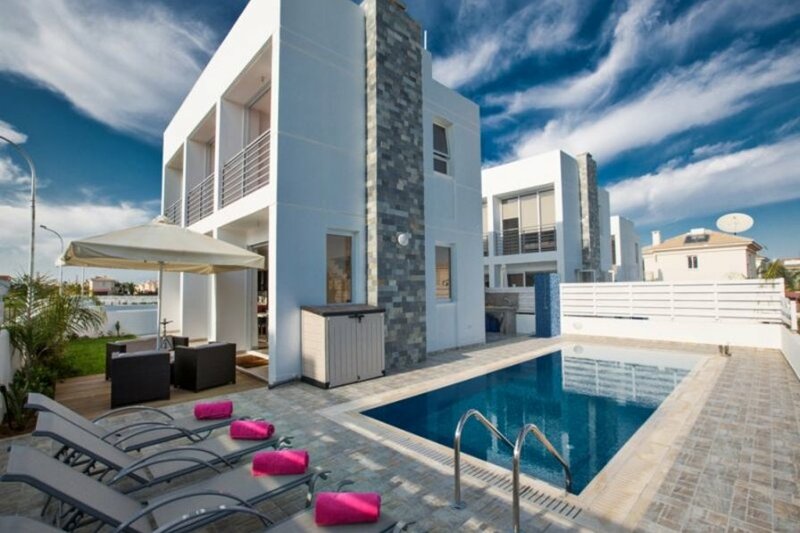 Brand new modern 3 bedroom villa in a lovely setting in Kapparis, Protaras. Private pool and walking distance to the beach. This modern and luxurious villa is located in the popular resort area of Kapparis and is just a 5 minute walk to the beach and to a good selection of bars, restaurants and shops. The villa is newly built and fully equipped with brand new furniture and fittings to ensure a very comfortable stay. The ground floor features an open plan living, dining and kitchen area. The living room has a comfortable sofa, widescreen TV with satellite channels, DVD player and WIFI connection. The modern kitchen is fitted with modern day appliances and features a granite breakfast bar. The dining area comfortably seats 6 persons. There is also a WC on the ground floor. Upstairs has 3 double bedrooms all with fitted wardrobes, along with a family bathroom featuring tub and overhead shower. Outside you will find the spacious garden and pool area, with plenty of daytime sun. There is a BBQ and sink area located to the side of the villa, ideal for outside summer dining. There are plenty of sun loungers, a pool shower and a separate seating area. The driveway offers private parking for up to 2 cars. Overall a luxurious and contemporary villa in a peaceful location, ideal for couples and families looking to enjoy a relaxing holiday.